Why Does my Stove Have a Rope Seal? It is a common misconception that a newly installed stove should be 100% airtight and although this is a near impossibility due to the nature of cast iron and steel, securing a rope seal along the interior edge of the stove door and glass will get you as close as possible. This seal (or gasket) prevents the wood burner from drawing too much air into the firebox, over-firing your stove and/or blackening the glass. Some European brands will have a gap at the top of the door where the seal is not complete. This gap has to remain as part of the air wash system for these stoves. What Rope Should I Use? 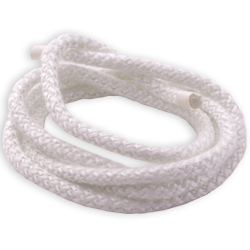 The rope seals supplied by Glowing Embers are man ufactured from a soft-weave fibre-glass with a heat resistance of up to 1200°C, making them safe for any and all closed heating appliances and flue systems. 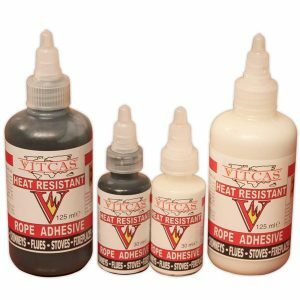 When Should I Replace My Rope Seals? 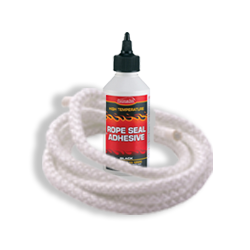 We recommend replacing (or at the very least inspecting) your rope seals annually. Have you noticed your stove is drawing more fiercely than it once did or the glass seems to have tar deposits forming quickly? This is a sign your seals need addressing. How Do I R eplace Rope Seals? Your stove manual should give you the diameter of stove rope to enable you to purchase the correct size for your stove. 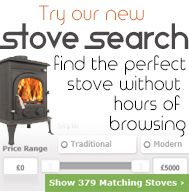 If you do not have your stove manual, you can check with the stove manufacturer as to the diameter that you will need to do the job. Don’t guess this size! – if the diameter is too small it will not effect a proper seal and if it is too large it may damage the door or hinges when it is closed. If possible remove the door from the stove and place on a flat surface, remembering to protect the glass from scratching. Remove the old rope and ensure all remnants of adhesive have been removed by using wire wool or a steel brush. Place the new rope into the groove in the door without stretching or bunching, allow 2-3mm for adjustment and then cut to size. Ensure the ends are cut at a 90° angle. Apply the adhesive into the channel and then place the stove rope on top. Secure the rope into place with tape or pegs (for example) for a full 24 hours to allow the adhesive to cure sufficiently. The application of some heat can quicken the process.